Digital inks are inks primarily used to print a digital image directly onto a medium using high-volume inkjet or laser printers. Two types of digital inks are inkjet inks and electrographic inks. Inkjet inks are less expensive than electrographic inks. These are mostly used in applications such as labels and computer printouts. Basic raw materials used for the production of digital inks include petrochemicals-derived products such as solvents, carbon black, resins, mineral oils, and intermediates. Digital inks offer high speed and superior print quality for images, graphics, and text. The digital inks market is anticipated to expand significantly during the forecast period due to the increase in the adoption of digital printing. Digital printing facilitates short turnaround time, on-demand printing, and modification of the image used for each impression. Digital inks are mostly used for applications such as desktop publishing, variable data printing, fine art, and advertising. Low volatile organic compound (VOC) emissions of inks and increasing demand for these inks from the textile industry are key factors driving the digital inks market. The textile industry is continuously evolving; therefore, printing has gained a strong foothold in the industry. Furthermore, the advent of digital printing in textiles has led to the increase in demand for customization and efficient printers. Color and design flexibility of digital textile printing enables better personalization and customization. This, in turn, reduces the need for storage of large stocks. Thus, the digital inks market for digital printing is expanding rapidly in the textile segment. Additionally, development in technology and introduction of high-speed single-pass large printers have led to the replacement of old, conventional printers. Rising demand for UV-cured printing inks and water-based inks is projected expected to boost the digital inks market during the forecast period. The global digital Inks has been segmented based on formulation, substrate, application, and region. In terms of formulation, the market has been divided into water-based, solvent-based, UV-cured, and others (including hybrid inks and discharge inks). The water-based segment dominated the market, accounting for a share of 30% in 2017. The UV-cured segment is expanding at a significant pace owing to its superior features. Based substrate, the global digital inks market has been classified into plastics, textiles, papers, and others (including ceramics, glass, and metals). The plastics segment accounted for nearly 30% share of the market in 2017. Plastics are employed in all types of packaging, and advertising & promotion application. Textile and ceramic segment are creating opportunities in the digital ink market. High product quality and speed are factors that projected to drive the digital ink market. In terms of application, the digital inks market has been categorized into packaging, advertising & promotion, textiles, publication, and others (including ceramics and glass). Digital inks are widely consumed in the advertising & promotion sector owing to their high quality, cost effective, and flexibility. Furthermore, demand for digital inks is largely driven by the rise in output of the textile industry. Urbanization and changing trends in the fashion industry have gained momentum in several developing economies, which is driving the textile industry. This, in turn, is boosting the digital inks market in these countries. Additionally, introduction of new designs and economic production, are key factors driving the digital textile printing ink market. Advancements in technologies are projected to fuel the market during the forecast period. In terms of region, the global digital Inks has been segmented into North America, Latin America, Europe, Asia Pacific, and Middle East & Africa. Demand for digital ink was high in Asia Pacific in 2017. 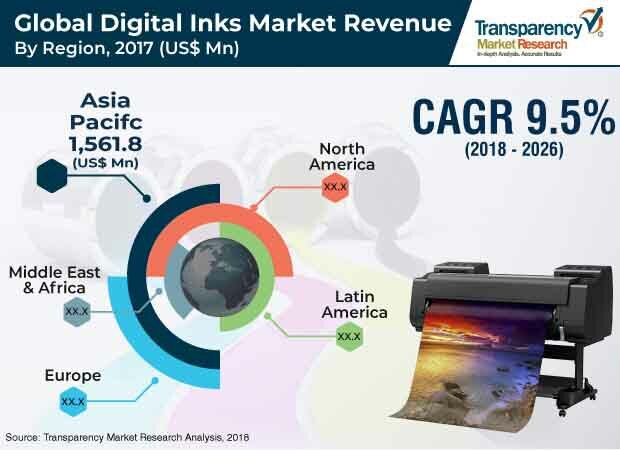 Economic growth, increase in digitalization, and rise in urbanization in China, Vietnam, and India are fueling the digital ink market in Asia Pacific. The market in North America has matured due to significant consumption of digital ink in the advertising & promotion application in the region. In Europe, utilization of the digital inks in Germany, the U.K., Italy, France, and Russia is increasing due to the rise in the packaging sectors. Middle East & Africa is expected to be a major region of the global digital inks market during the forecast period due to growth of the textile sector and increase in digitization in the region. This is projected to create significant opportunities for digital inks manufacturers in the near future, primarily in the advertising & promotion sector in emerging countries. The report comprises detailed value chain analysis, which provide a comprehensive view of the global digital inks market. The Porter’s Five Forces model has also been included to help understand the competition landscape of the market. The study encompasses market attractiveness analysis, wherein formulation, substrate, and application segments have been benchmarked based on their market size, growth rate, and general attractiveness.